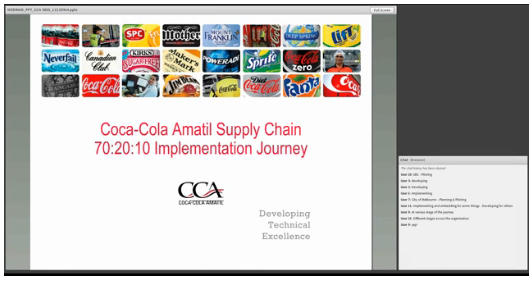 This post is one in a series sharing the case study of the development of a Community of Practice for Maintenance and Engineering teams at Coca-Cola Amatil. As discussed in the case study post on context, this initiative is expected to contribute to reducing equipment down-time and decreasing risk associated with concentration of deep process knowledge in a small number of long-tenured Engineers. 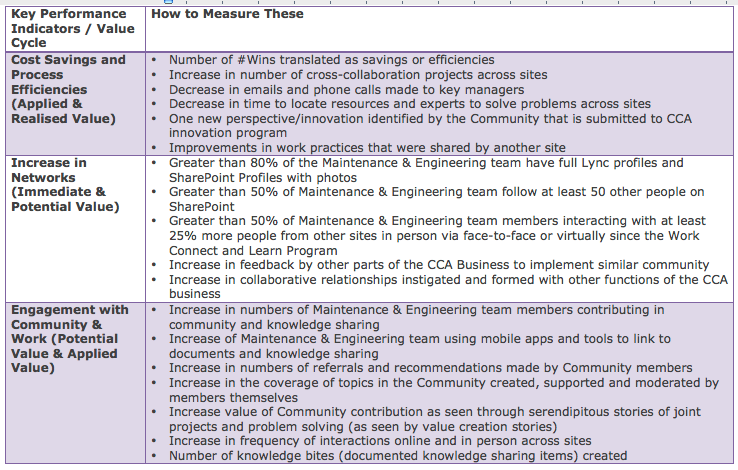 A number of Key Performance Indicators (KPIs) were identified up-front to evaluate the value created by this community. This was informed in part by the conceptual framework of value creation from online interactions from Etienne Wenger, Beverly Traynor and Maarten De Laat. See Jane Bozarth’s article for an introduction to the value creation cycles in the framework. Monitoring of some of the measures will occur on a monthly basis during this six month period to help inform community management. The careful reader may have noticed that indicators of Reframing Value have not been explicitly included in the KPIs. While we have not explicitly set objectives for value at this level, it will be surprising if this does not follow success in the other value creation cycles. Reframing Value will be identified through value creation stories. The value creation framework has recently been expanded to include strategic value and enabling value. We’ve not yet considered whether / how to include these in our evaluation strategy. I came across the idea of using value creation stories to assess the value of online interactions in an article by Jane Bozarth. She used a conceptual framework from Etienne Wenger, Beverly Traynor and Maarten De Laat to write the story of how her online interactions create value. Their framework thinks about value in terms of five different cycles, which Jane summarises clearly in a diagram in her article. 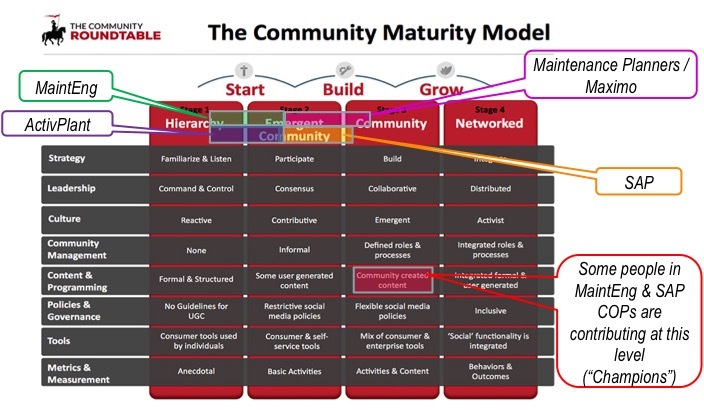 As Jane urges, I have read the full text of this framework, and have used their guiding questions to write a value creation story about my participation in the 702010 Forum. This is my practice run in preparation for gathering value creation stories to evaluate communities that I am helping develop in my organisation. I’ve written this post by responding directly to the guiding questions relating to each cycle of value creation. However, I would document value creation stories within my organisation by writing or recording (audio or video) a more natural narrative. The 702010 Forum is a community of practice for learning and performance professionals applying the 702010 framework. Membership is subscription based, with some resources and webinars publicly available. 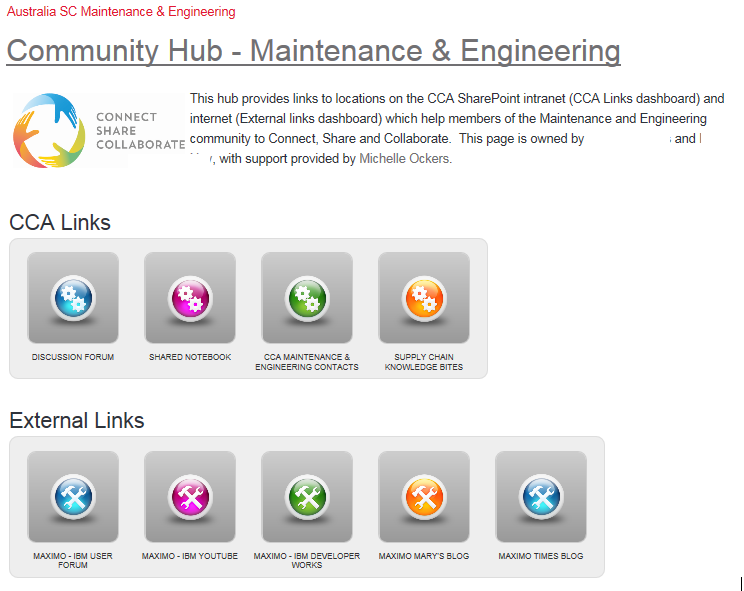 A toolkit contains resources to support application of 702010, and members can participate in a range of events and an online discussion forum. Within a few months of joining the Forum I realised that while my organisation had adopted the 702010 framework a number of years ago, we had narrowly interpreted it. We were deploying blended learning where we used activities based on learning from experience (70) and others (20) within formal structured programs. However, we were not purposefully enabling people to learn as they worked or building ongoing social learning capability. From a webinar on the changing role of the learning function I saw that the skills of our capability team needed to be broadened. I gained an understanding and language to talk to key stakeholders about the opportunity to impact organisational performance more effectively if we added performance consulting, performance support, and social learning to our toolkit. These activities and insights enabled me to have different discussions about 702010, our learning strategy, and internal Capability skills, particularly with senior managers and our Capability team. The most significant shift it enabled was an update to our Capability strategy in April 2014 to include ‘Continuous Workplace Learning’ as an element. 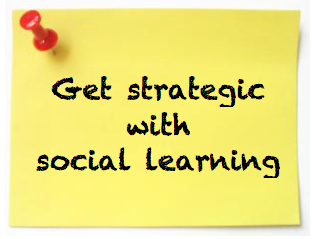 This broadened the remit of our Capability team and created the space for us to get strategic with social learning. We revamped our Governance Board by applying the “Toolkit for Establishing a Learning Governance Board.” Consequently we get better value out of our quarterly meetings by focussing on alignment with our business strategy. As per the examples given above, application of ideas, tools and solutions from the 702010 Forum has enabled me to perform and contribute to my organisation in ways I may not otherwise have been able to. The 702010 Forum was one of the first Learning & Development communities that I’ve participated in. During 2014 I got active on Twitter and started this blog. This helped me to create a Personal Learning Network (PLN) which encompasses many other communities (e.g. Third Place, OzLearn, PKMChat). Collectively my participation in a number of communities and interaction with my PLN has transformed and accelerated my professional development. One way that the Forum has supported my development has been by increasing my confidence to work out loud publicly in order to learn and improve. 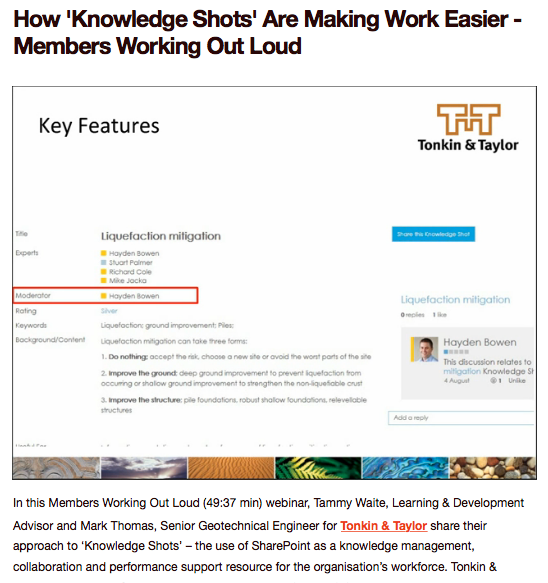 In December 2013 I delivered a case study in a Forum webinar. I found the reflection and learning from delivering this webinar valuable, and saw that others could benefit from me working out loud. This was a catalyst – it gave me the motivation and confidence to continue working out loud by blogging and speaking at conferences. Realised value for my organisation is unfolding. 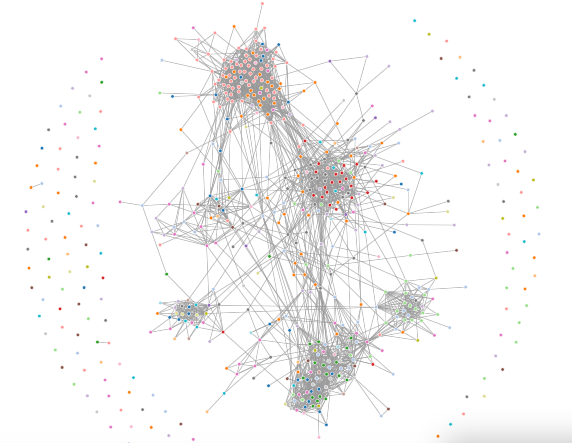 It’s also difficult (and unnecessary) to unravel the influence of the 702010 Forum on my organisation’s performance versus that of other communities and networks I participate in. Our Capability strategy is better aligned to our overall business strategy as a result of applying ideas and tools from the 702010 Forum. We are using a broader range of Capability approaches and activities to achieve our goals. I think it will be another 6-9 months before we are clear on the outcome of these activities. An emphatic YES to this question. It’s shifted the perspective of two very important stakeholder groups, senior managers and the Capability community, about the importance of the 70 and 20 elements of the framework and the range of approaches we can use to build Capability. We’ve reframed our Capability strategy, launched communities of practice and embraced performance consulting. I shall close by encouraging everyone reading this to reflect on the communities and networks they are part of and consider their current level of participation. The more you participate, interact with others, apply ideas from these groups and share back what happened, the more value you create for yourself, your organisation and other community members. So, what are you waiting for? Get in there and participate. I’d love to hear about the value that others have found in participating in communities and networks – you can leave your thoughts below or pingback to your own blog posts.